As a child I loved reading about other people’s families. Little Women, I Capture the Castle, and more recently dipping into children’s books as an adult, I felt that same pull with Perfectly Ella by Candy Harper, and the Pea series of books by Susie Day. Then, in April another book landed on my desk that worked the same magic, and pulled me into a new family, whom I adored reading about and was sad to finish. 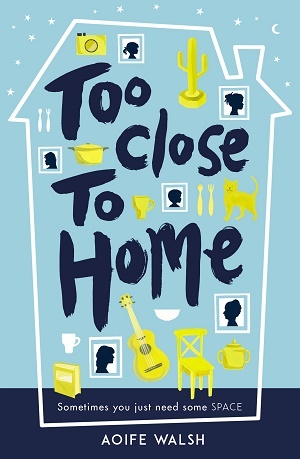 Too Close to Home follows 14 year old Minny, a thoughtful, vivacious, complicated character with an equally complicated, loud and unique family. Told in the third person, which makes a change from so many which are told from the first person point of view, this slants towards Minny, but allows the author Aoife Walsh a little distance from her main character, which helps to give a greater perspective. Minny lives with her mother and grandmother, as well as her older sister Aisling, who is autistic, her younger sister Selena who has her own quirks, and her baby brother, whom she helps to look after. They are a single parent family, yet with much mention of extended family relations, from grandparents and their add-ons, to Minny’s father and his new family. It mirrors many jumbled family situations today, and is both a good insight and good reference into family life that isn’t just two parents plus 2.4 children. Aofie’s talent is to give her main character a sympathetic and realistic voice, and to have her surrounded with problems, not all of which she can solve successfully, and certainly not on her own, and to push the idea that today’s teens are dealing with so many issues – from helping immediate family with childcare and domestic responsibilities, to friendships and boys, to schoolwork and in this particular case, to protecting her older sister, and learning where her loyalties lie. It also makes the point that young people do need grown-ups to help them make the right decisions, and to give useful advice: grown-ups including grandparents and responsible members of society, not just direct parents. Because there are so many characters, especially those living under one roof, Walsh has used dialogue to punctuate the story and develop the plot, and she clearly has an ear for it – the conversations are realistic and punchy. The book immerses you in the family, the reader feels as if they too are in the middle of the arguments, laughter and dinner table antics; it was like being a fly on the wall of the house down the street. There’s more than one hint of diversity here, from different social stratas – one of Minny’s grandmothers is giving shelter to a boy whose own mother has substance abuse issues – to different sexualities – Minny’s best friend has two mothers. It’s great that Aiofe Walsh is able to include diverse characters in such a matter-of-fact way – this is not an ‘issue’ book, but simply portrays people from all walks of life with their own different concerns and backgrounds.There are also references that sit the book firmly in modern times – from cultural and food references, to references as to how global our modern world is – people move country so easily. Once engrossed in the book, Walsh’s fictional family loom so large in the mind that it’s hard to believe they don’t really exist. You’ll want to remain in their house for far longer than the book. A thoroughly enjoyable read for ages 12 and up, written in a classic contemporary style. Buy it here from Waterstones, or on the Amazon sidebar. With thanks to Andersen Press for a review copy of the book.